Recently, N and I celebrated our favorite friends’ birthdays. R and C have birthdays a week apart and last year, had a great party to celebrate. This year, they decided not to celebrate with a party, but I couldn’t let their birthdays pass without some kind of celebration! We invited R and C over for a birthday dinner. I was racking my brain on what to make them. I wanted to make something fun and not too stuffy. Stuffy is not their style. I found a great recipe from fellow blogger Love and Lemons and knew it would be perfect for them. I gave their recipe the small eats twist, by putting the burger patties on a bed of greens (my little Eat More Greens friend on my shoulder was very happy) and added roasted sweet potato chunks to the now salad as a fun twist on fries. Preheat oven to 375. Line a baking sheet with foil and another with parchment paper. In a small bowl, combine the ground flax and water. Stir with a fork or whisk until throughly combined, then place in the fridge to set up. On the foil lined sheet, spread the cubed sweet potatoes. Sprinkle spices evenly and drizzle olive oil over the potatoes. Roast for 15-20 minutes, until fork tender. Heat olive oil in a pan. Cook leeks and cloves until translucent. Add the spices and cook for another 30 seconds. Add soy sauce, tomato paste, walnuts, and 1/2 cup of the black beans. Stir to combine and cook for another 3-5 minutes. Transfer the bean mixture to a food processor and add the flax egg. Run food processor until everything is mixed throughly, but not super smooth like hummus. Transfer mixture into a bowl with 1/2 cup of black beans and 1/2 cup of quinoa and stir to incorporate. Separate the mixture into four balls and shape into patties. Take the remaining quinoa and cover each of the patties in quinoa. Place on parchment and chill for 20 minutes. While the patties are chilling, combine yogurt with sriracha to make the dressing. Refrigerate until dressing. Place the patties on the baking sheet with parchment and lightly drizzle olive oil on the patties. Bake for 15 minutes, then flip and bake for another 10. 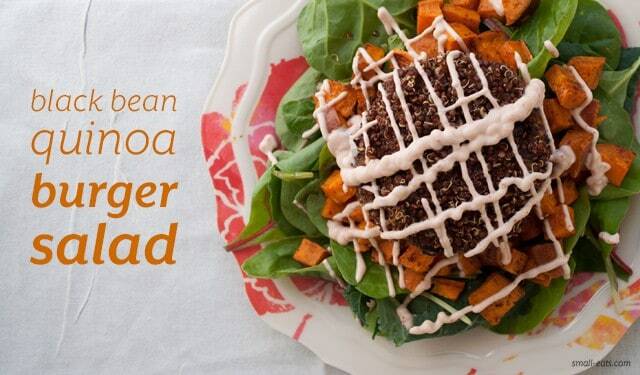 To serve, put a few handfuls of mixed greens on your plate, then add sweet potatoes, followed by the burger. Dress with spicy greek yogurt and enjoy.